Are you among those unlucky ones who find it difficult to maintain a healthy skin? If yes, read this article and you will benefit a lot from it. Many women, who suffer from dry skin problems, fear the approach of winter, when it becomes really a hard task to keep the skin well hydrated and soft. Now you need not fear such things. All you have to do is to get Vitamin E capsules and supplements and say goodbye to skin problems forever!! Vitamin E is often known as the ‘skin life saver’ because of its immense benefits for the skin. It helps in making your skin revitalized and healthy, providing a smooth glow to the skin. It is suitable for all types of skin and does wonders for the skin. According to beauty and health experts, you need not wait till you are in your 30s to take care of your skin. It is better to take care it and give it some attention from your early 20s itself. This way you can keep your skin healthy and in excellent condition even when you reach your 50s and 60s. 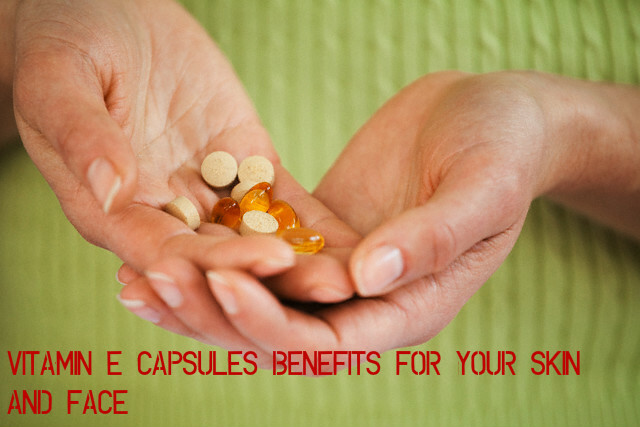 Vitamin E capsules and Vitamin supplements are very useful for taking care of your skin. Are you worried about those wrinkles and dark spots on your skin? Just take Vitamin E capsule and take the fluid inside it. Apply this all over your face and under your eyes before you go to sleep at night. Leave it overnight. This will work on your skin as you sleep at night and helps in keeping your skin well hydrated. The wrinkles and dark spots will vanish with regular use of these capsules. An easy way to get the benefits of Vitamin E is to gulp down one capsule daily. This is easy and will not take any of your precious time. If you are too busy to cut the capsule and add it to your moisturizer or lip balm and then apply it, this is the best option for you. Have this capsule daily for two weeks and you will the difference it makes to your skin. If you think that stubborn stretch marks are never going to fade away in your life, you are wrong. Vitamin E capsules help you get rid of them. Puncture Vitamin E capsule and take the fluid from it. Mix it well with fresh lemon juice. Massage this on the stretch marks gently for a few minutes. Leave it for about 30 minutes and then wash it off with water. With continuous application of Vitamin E capsule on the stretch marks, you will see a significant difference within a month. Cracked lips are very common, especially in winter seasons. If you are suffering from dry and cracked lips. Add the contents inside a capsule of Vitamin E to your lip balm and mix well. Apply this vitamin E enriched lip balm on your lips. You will start getting positive results with regular use. Are you suffering from pimples and ugly marks on your skin? Vitamin E capsule is an excellent remedy for such problems. Take some amount of the fluid from the capsule and dab it on the affected area of the skin. Apply this regularly and you will see that within a few weeks they start to fade away. This is due to the antioxidant properties of the Vitamin E in the capsules. Make use of the emollient properties of Vitamin e capsule by applying it on the skin that is wet. This way you will have a soft and smooth skin that you will be proud of. Vitamin E capsule is also a good remedy for flaky skin on the knee and elbows. Moisturize your knees and elbows and then dab a capsule of Vitamin E on the affected area. Applying this regularly for a week will provide you soft and smooth skin on the knee and elbow areas. As your age advances, you become more and more conscious about your skin and want to make it look as beautiful and healthy as it was earlier. With age, wrinkles, dark spots, fine lines and crow’s feet start to appear on the skin. Some accept it as a part of process of aging while others are worried about it and want to remove them by any means. Now you have a solution for it, which is also natural. So, try it out and look young and beautiful as you wish yourself to be. Vitamin E capsules and supplements have the power to regenerate your skin. This way your skin will look revitalized and rejuvenated. So start applying Vitamin E on your skin from today itself. Here is tip on how to use it on your skin. Puncture this capsule and add the content inside to the moisturizer or lotion that you apply on your skin. Apply this homemade Vitamin E enriched lotion on your skin. This is easy and also very effective. If you have a breakout of acne on your skin or if there are acne marks on the skin, Vitamin E capsules and Vitamin E supplements is one of the best solutions for such problems. These capsules are loaded with antioxidants, which help in fading away and removing the scars, age spots, dark spots etc on the skin. The antioxidants fight against the free radicals in the body and prevent the oxidation of molecules in your body. It is the oxidation of molecules that cause damage to your skin and collagen. So, apply Vitamin E capsule on the skin or take its supplements and you will have a healthy and young looking skin. Now that you have seen the various used of Vitamin E capsules, incorporate it in your daily routine and see how healthy and beautiful your skin will look.